I got hip to Hiero when I was about twelve, I was told that that was real hip-hop right there not whatever I was listening to at the time. After hearing "93 Til Infinity", I am still dispute that statement being that there is room for just about anyone in the hip-hop culture. Take the Hiero members on this record : The Souls sound kind of wacky and off-key as "Let Em Know" ramps up but "Live and Let Live" , you can tell that they are not just a gang of jokers. "93 Til Infinity" is a record revolving around a group of misfits from Oakland as they document the pressures that they face ("Live And Let Live") in a semi-moral-less environment (peep the robbery story in "What A Way To Go Out") while still exhibiting fun with youthful exuberance ("A Name I Call Myself", "93 Til Infinity") hard to recapture. The only drawbacks? As with any group hip-hop record, there are just too many voices for the average listener to follow a cohesive narrative and just as well the run time was bloated due to all the members on the record. A great intro into the Hieroglyphics, but after "93...", I think I will stick more to giving an ear to their solo efforts. The chillest hip-hop album ever. 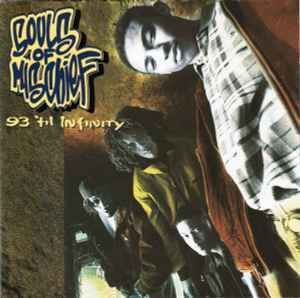 If the title track "93 'Til Infinity" leaves you unmoved, I wouldn't like to have the same musical tastes as yours. Seriously, that instrumental is just too cool ! Pure emotion. A proof that hip-hop is not only made with violence. Less known than Biggie, Eazy-E, 2Pac, Nas or Mobb Deep, this is one of my top 10 hip-hop albums. This is how we should chill in 2018. This pressing sounds excellent despite cramming almost 30 minutes of music onto each side. This is the Canadian version according to discogs, but there is no US version that is not the Blue tape. The Canadian version is a black tape, the US version is clear. Ah...yes...finally! Great 2CD edition of a classic Hip Hop LP, with bonus material galore and lovely book / booklet design. Does that cheesy birthday card thing when you open the first page and starts playing an incredibly tinny version of '93 til Infinity!